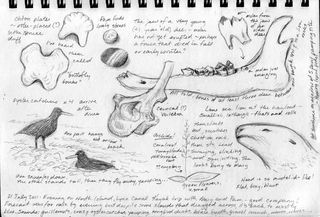 Spent a blissful three days puttering around Benjamin and North Islands with two naturalist friends. Kayaking and exploring conditions couldn't have been better: warm, sunny days with glassy water, cooler breezy evenings, lovely sunsets, few biting insects. Most importantly, we were surrounded by a paradise of nature puzzles and treasures to discover. Here's a first page of sketches; I'm planning a second page of memory sketches and notes and plan to post it soon. UPDATE: looks like our mystery orchid is Malaxis (Hammerbya) paludosa, bog adder's-mouth orchid.